If you have an old Scrabble game that has lost too many pieces to be functional as a game, you can still use it for unique and creative art crafts. This is a guide about scrabble wall art. Here is a fun craft that can be just as much fun for the "giver" as the "receiver". We chose family and pets. Enjoy creating a gift that won't end up being returned! 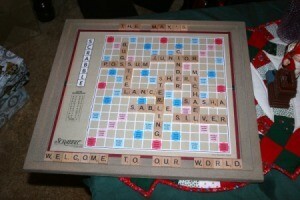 Make frame by laying Scrabble board on the inner most "step" of the 3 step molding. When frame is made, paint. We used the textured Valspar in the picture. It is "thriftier" at Lowe's than a craft store. We found the frame will require two coats. 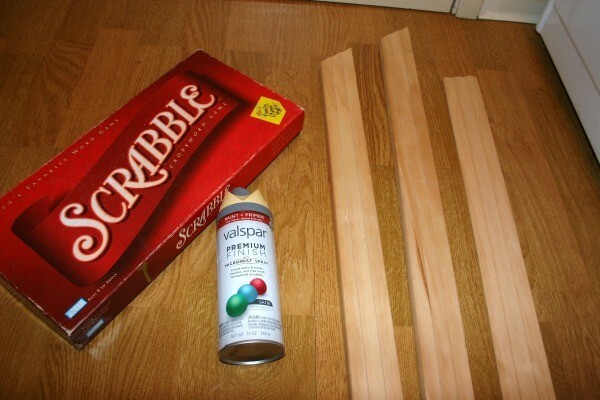 When dry, glue Scrabble board to the inner most step of the three step molding. We used Titebond Ultimate III. Place tiles. I would suggest taking a picture before beginning to glue on. We used a white glue (with the orange tip) to afix the tiles to the board. On the second step of your 3 step molding, place your top and bottom titles using the white glue.